Renoma Cafe Gallery (hereby referred as RCG) has been blogged about by nearly all the food bloggers in Kuala Lumpur, some even more than once. I have been tempted time and time again, but it was Kc’s undying excitement that finally saw me walking into this restaurant with a very unique concept. Walking in, you first encounter some display of shoes, bags and clothes. Then it opens up to a spacious dining room with hues of black, red and silver, funky art pieces installed everywhere. 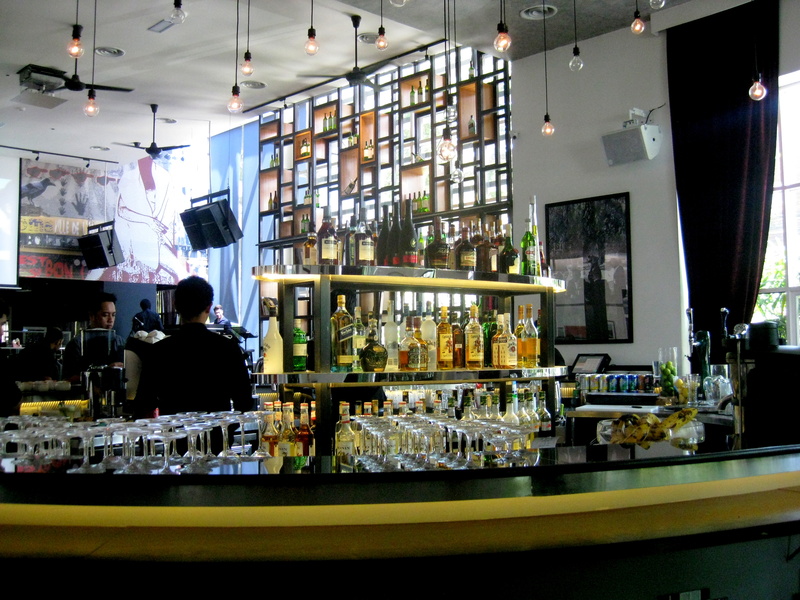 The Bar, love the hanging lights! 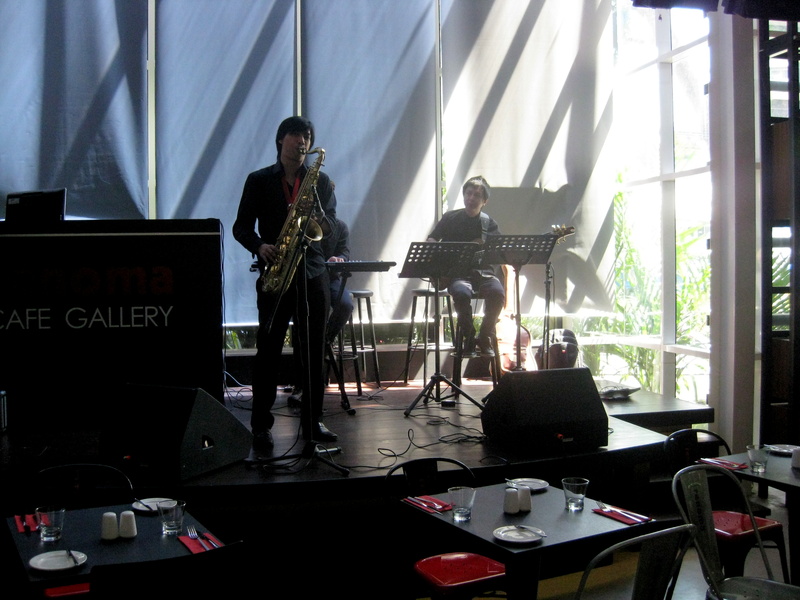 Jazz and good food on a Sunday afternoon, just perfect. I will admit that I have already studied the menu a few times before I even went to RCG. So let’s not waste anymore time and start with the food! First to arrive was some previous Hokkaido Bay Sea Urchin, Deep fried bean curd, Salmon roe, Poached white asparagus, sitting in the Hong Kong Chilli Oil Broth. As you can see the dishes for the buffet are made smaller so we could sample more dishes at once! The combination worked well, and sea urchin was suitably fresh. I especially love the crunchy asparagus. The creamy tofu takes on the flavourful spicy broth, addictive. Unfortunately, the vegetarian options are quite limited on this menu. This was one of them. 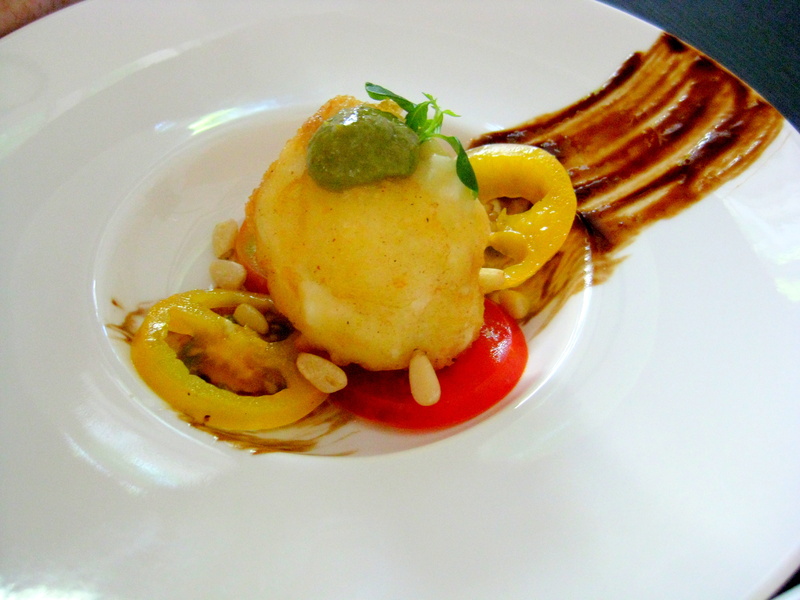 The ball of fried Mozzarella cheese was nesting atop some heirloom tomatoes, pine nuts, and smear of aged balsamic reduction. The cheese seemed to be a little too chewy, perhaps they have been sitting around a bit. Flavours are great though. Frank detected a hint of fish so he couldn’t eat this. There are 4 dishes on the menu with Foie Gras and this was excellent. 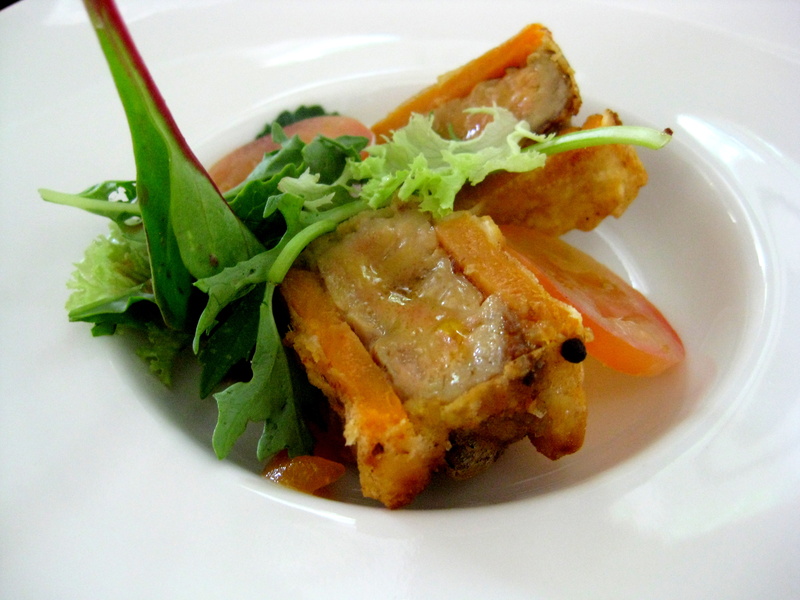 The fatty liver slice was sandwiched between slices of sweet potato, battered and deep fried. I love how the tropical fruit compote helped cut through the richness. I will have it again next time! The other Foie Gras dish I ordered. 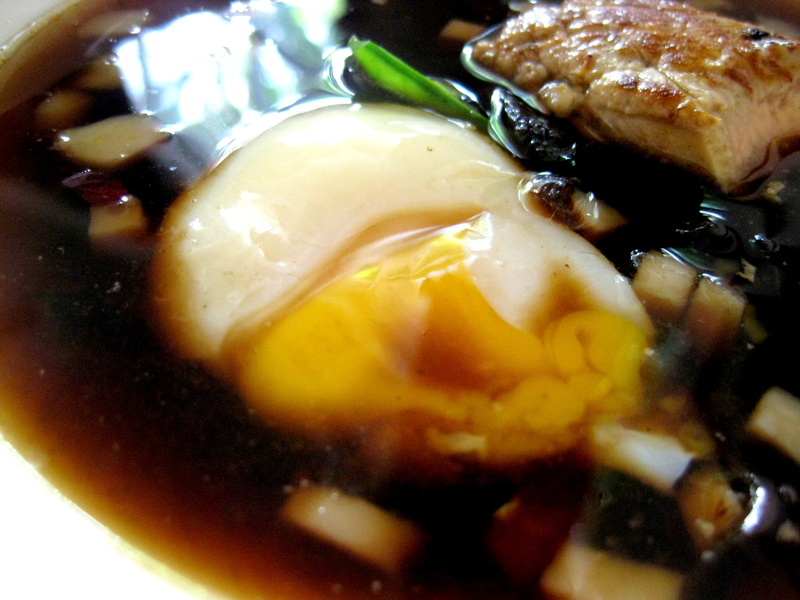 Nice big piece of Foie, pan-seared to perfection, paired with gooey poached egg and rich smoked duck consomme. Very well-executed dish. The wood-ear fungus and water chestnut provided some much needed crunch. Now that I looked at the picture, I wonder why I hadn’t ordered more dishes with liver, perhaps my conscience was telling me not to go overboard. Never mind, there will be a next time. I’d like to reiterate how much I appreciate the tasting portions, especially when it comes to carb-laden dishes. 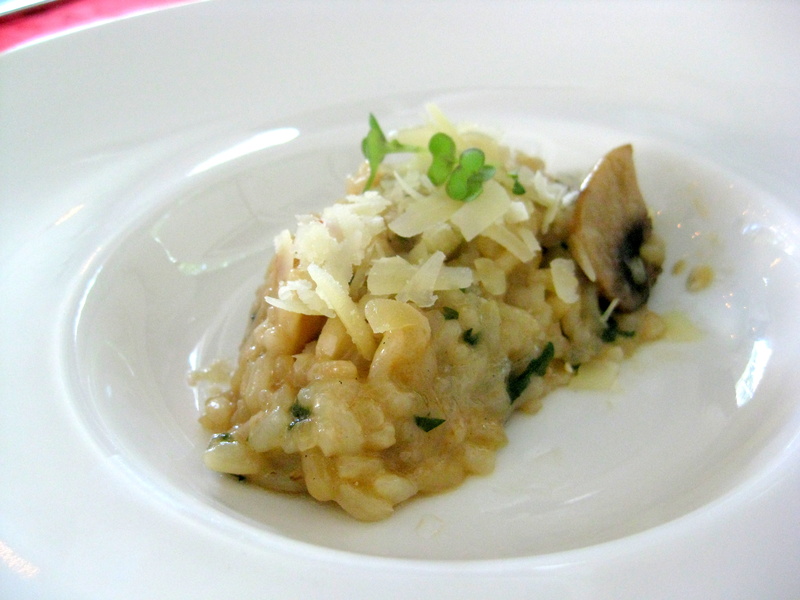 I love the mushroom risotto. Perfectly cooked and seasoned. Frank couldn’t have it because it contained chicken broth and we have asked if they could do this with vegetable broth next time. You know, to cater for the non meat-eater. Best dish of the day. Done medium rare, the steak was tender, juicy and further enhanced by the fantastic port wine sauce. The truffle mash might be a little under seasoned on its own but pairs exceptionally well with the sauce. I enjoyed the crunchy vegetables and wiped this plate clean. 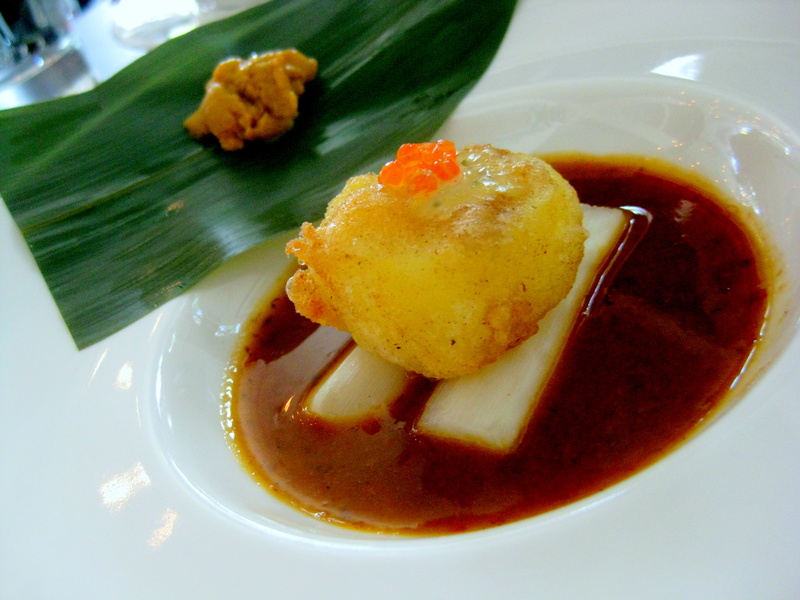 Having been to Nobu for the original Miso Black Cod, I have high expectation for this dish. It’s decent but I think the cod was slightly overcooked and hence lost the delicate texture. 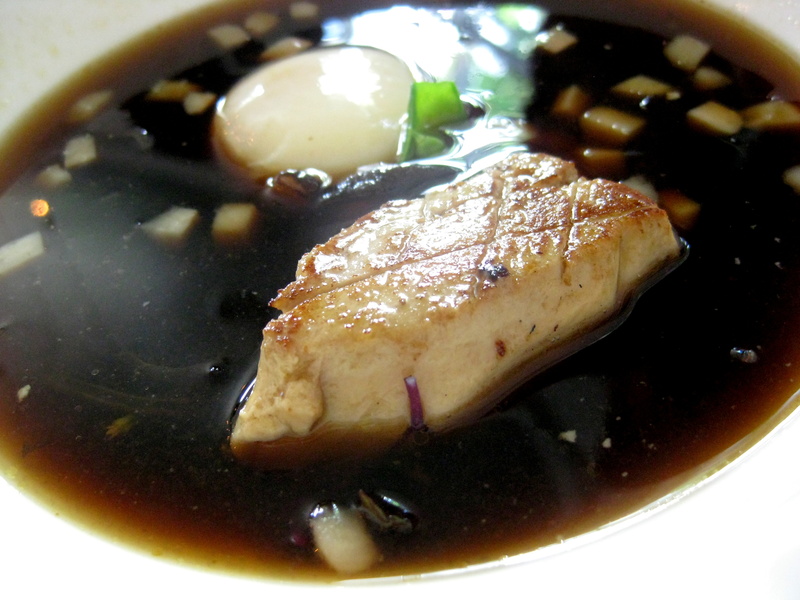 Coincidentally I had a piece of cod marinating in the same Saikyo Miso marinate and I cooked that the next day. Will blog about it next. 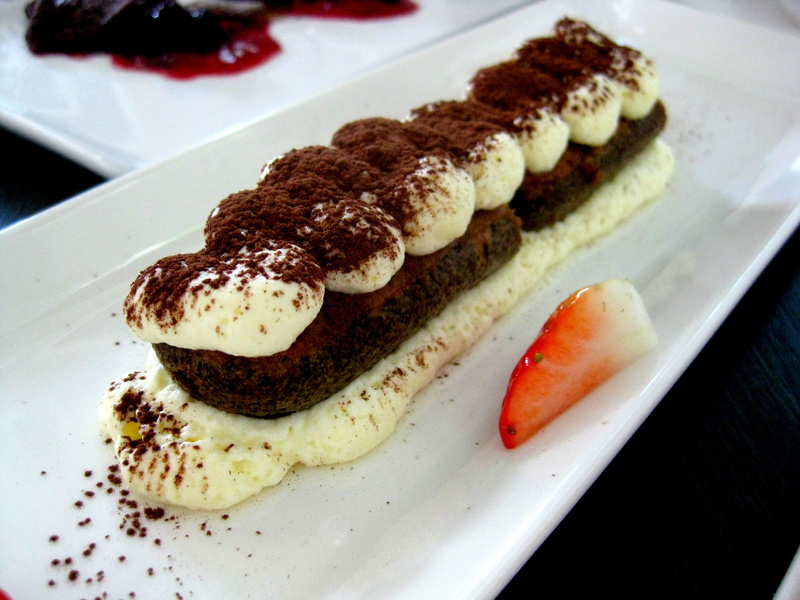 Because Frank hardly had any savoury courses, we decided to go all out on the desserts and ordered almost everything. Frank walloped three of these up. I like the citrus tang imparted in the custard. The burnt sugar was perfectly crispy. We had a bite of this and our eyes popped. It was rich with coffee liquor and moreish. In fact, we went ahead and ordered another one which Frank hogged and finished. I love the combination of the bittersweet chocolate and super tart raspberry. It’s a match made in heaven. 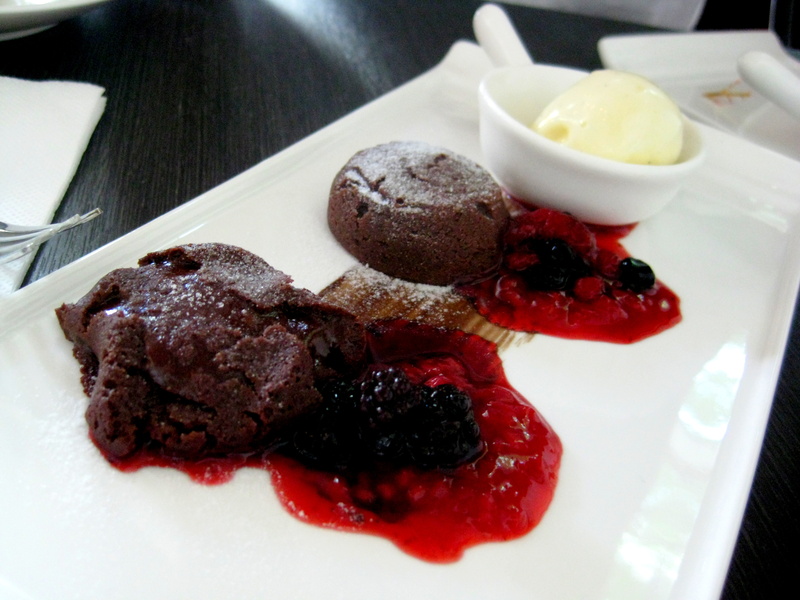 Nothing to fault in these cute fondant puddings. 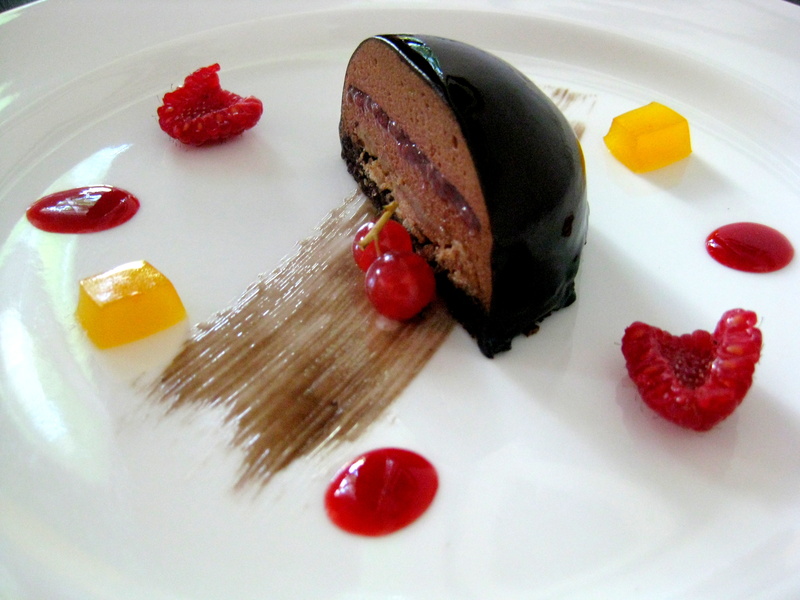 Once again the combination of chocolate and forest berries worked well. Evidently, good quality chocolate was used and it showed. Unfortunately the apple pie didn’t work this time. It was more a Cinnamon pie than it was apple. The aroma was a little too overwhelming even for the cinnamon lover in me. Frank barely touched it. Not pictured: Forest Mushroom Veloute (was surprisingly bland despite the good reviews, might be a bad day), and Peach Melba (It’s decent with a combination of fruits, good for palate cleansing). The two of us hardly managed 1 fifth of this menu but I reckon we have definitely got our money’s worth. We just didn’t do as well as some of my friends (you eating monster, Kc!). Which means I have to go back there soon to sample the rest. Next week, anyone? All photos taken with my very ancient Canon IXUS80 IS. Lot 510, Jalan Bukit Bintang, Kuala Lumpur. Oh is this like a promo thingy for a limited time or what? Looks good…it would be really great if I get to taste all the dishes. Except I am such a small eater. They have just launched this (I went on the second week) so I guess it will stay on for a while. It’s worth it even for small eaters! Frank barely ate anything. Ahhhhh!!! There’s live music! I like!!! You did not go up to sing. A number of people blogged about the place. Love the decor…food good too – just the name…brings to mind those men’s underwear. LOL!!!! Hehe then I must be the only blogger who hasn’t been there and blogged abt it. I bet you’ll be going soon! Yeah I think his blood sugar shot through the roof that afternoon! Luckily we don’t do that often. Still haven’t gotten around to visiting this spot. 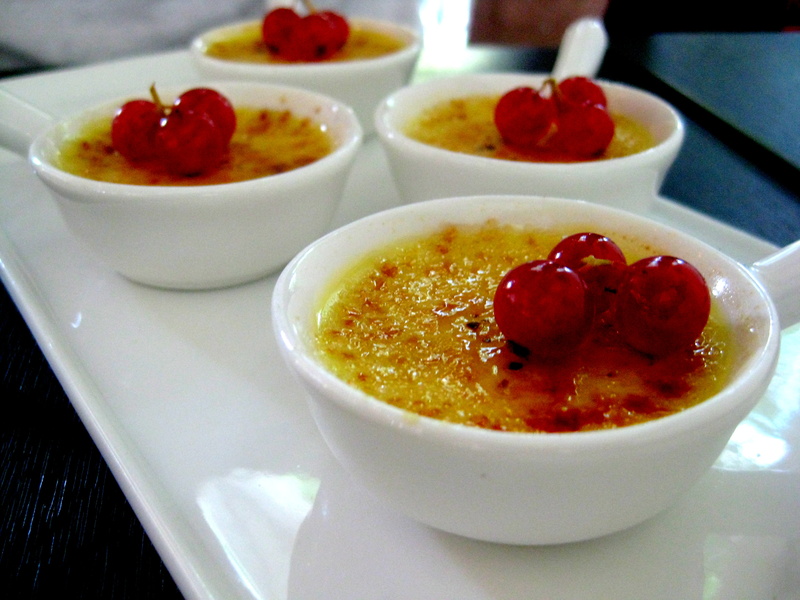 Your pics are making me hungry though! Yeah both were very good! 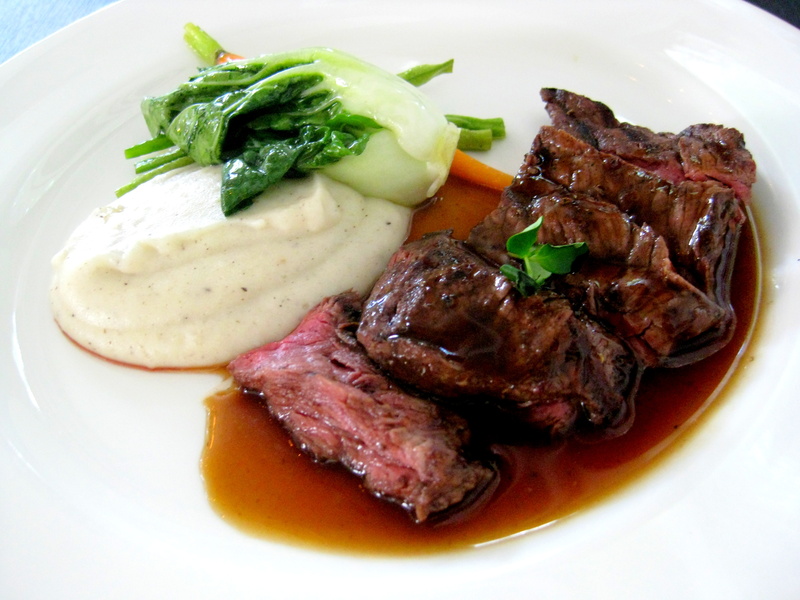 😀 I just learnt that Hanger steak (aka butcher’s cut) is part of the diaphragm muslces, like skirt steak. When cook properly it’s tender and flavourful. Whohoho! Love all the desserts! 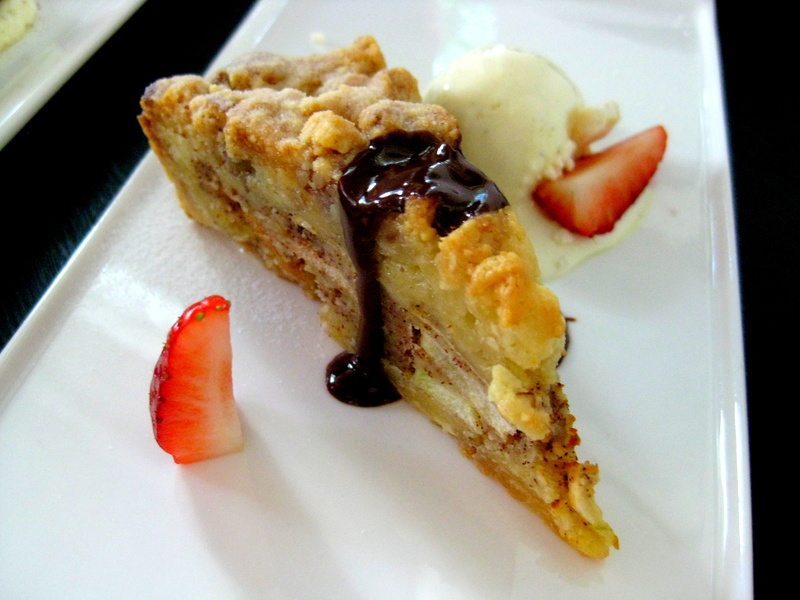 This place looks wonderful especially their desserts. I can see most of their food are made with lots of dedications. Yeah I was full all the way to midnight!! 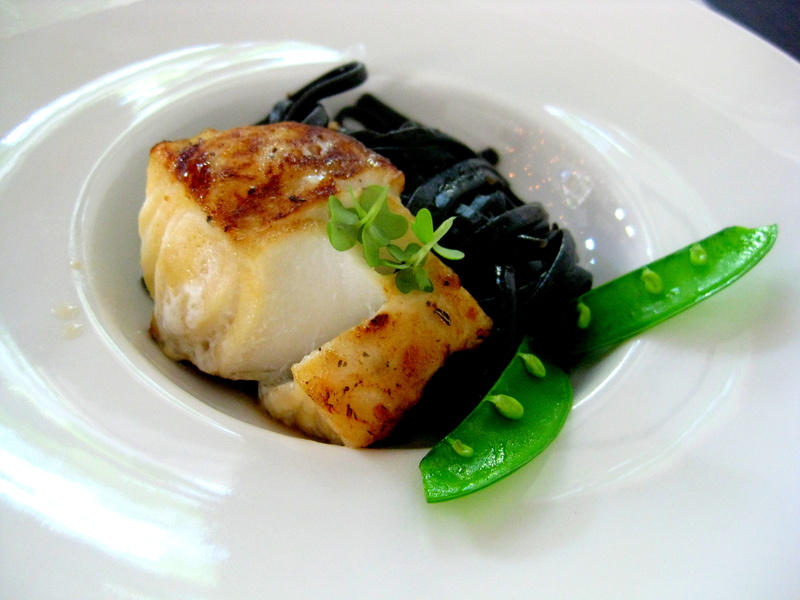 I saw your home made miso cod hehehe! I’m sure it’s better! Yeah there are also many other main courses if you could stomach them all at once! Go soon!